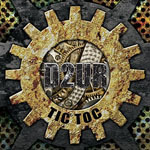 Share the post "Album review: D2UR – Tic Toc"
D2UR (pronounced Detour, really?) are a no-nonsense Canadian band built around the partnership of Mike and Diane Isbister. He plays guitars, she sings. Starting out as a covers band, their debut release Rev U Up (2013) was something of a learning curve, and discovering their own sound. The follow up Tic Toc is more focused – rockier, edgier, grittier. It’s an accomplished, straight ahead set focused around some solid, uncomplicated guitar playing, some decent tunes, and sultry vocals. They may not exactly be ‘veterans’ but D2UR is a labour of love, away from the ‘day jobs’. While Diane was influenced by the melodies of Fleetwood Mac, Sheryl Crow, and Tom Petty, Mike had rockier roots – Montrose, AC/DC, and Deep Purple. And while D2UR started out as a covers band, Tic Toc is quite a breath of fresh air. Good time rock ‘n roll. You can’t beat it when a decent song is delivered with no frills and great vocals. The set opens with ‘Silver & Gold’ – a huge slab of Rolling Stones/Faces style rock ‘n’ roll, ‘Run Devil Run’ is a windows-down, hit the highway blast, and ‘Losing Control’ rocks out like Sheryl Crow with a nicely raw ‘garage’ edge. And it’s that ‘vibe’ that permeates Tic Toc. Forget guitar pyrotechnics, shredding, and the ‘need for speed’, this is good ‘old fashioned’ playing that brings back fond memories of Whistle Test sets. This entry was posted in ALBUM REVIEWS, ALBUM REVIEWS (Mobile), All Posts, The Best of 2017 and tagged album, D2UR, Diane Isbister, hard rock, melodic rock, Mike Isbister, review, Tic Toc. Bookmark the permalink.